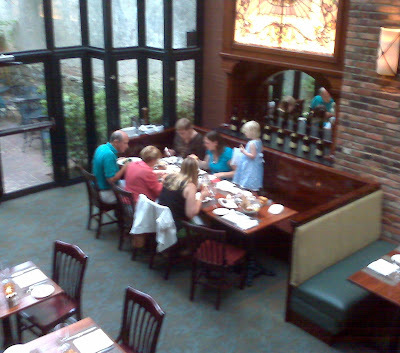 A few weeks ago I met some friends for dinner at a great new restaurant in the heart of Old Town, Alexandria. 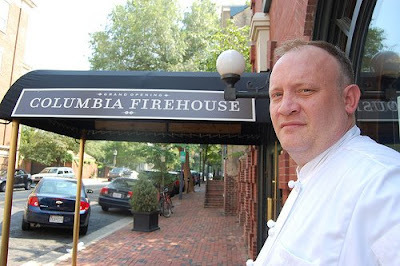 Columbia Firehouse (part of the Neighborhood Restaurant Group family), and Chef Orlando Hitzig deliver all around--good food, creative presentation and a cozy-chic atmosphere. The restaurant has a great feel, both iconic and familiar all at the same time. If you're looking for a restaurant that's cozy enough for a Friday night dinner with friends and special enough to show off the city to your out of town guest, this fits the bill. I was the slightly crazed girl snapping pictures with her camera phone during the meal. I do this all for you people, so enjoy. 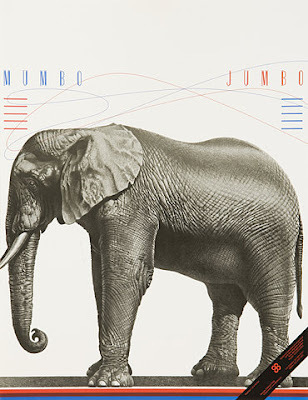 The name pays homage to the firehouse that use to inhabit the building around the turn of the 19th century. A lush dark wood bar leads you in to the main dining room and then out to a quaintly-beautiful gated patio. I'll be booking the patio for my birthday bash-09, so stay tuned for a party report later this fall. 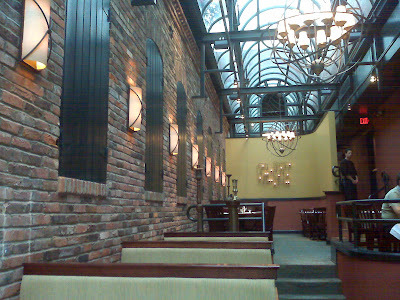 The upper level of the building will also soon boast a more upscale chophouse. 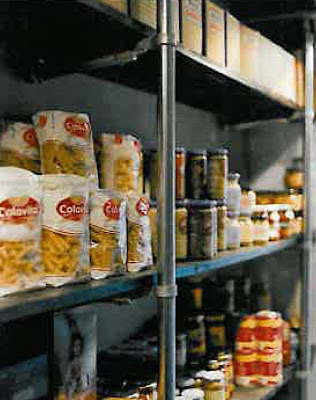 As in life, Columbia Firehouse is made in it's attention to details. 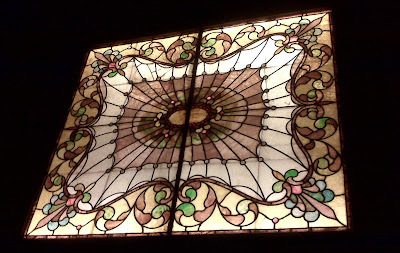 The picture above was a beautiful piece of stained glass on the wall above our table (great lighting by the way, very flattering to the complection when dining). 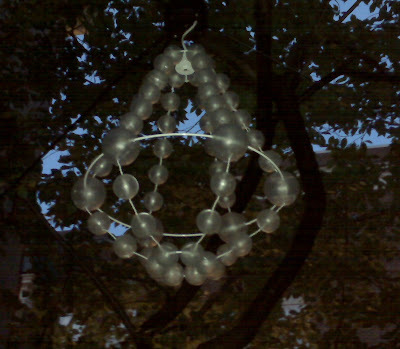 And the chandelier below hangs in the center of the patio. It illuminates to also cast a beautiful glow around the tables, but the patio was closed the night I was there. The details carry over into the delicious food. I highly recommend the mussels (ham, garlic and red pepper was my favorite version). 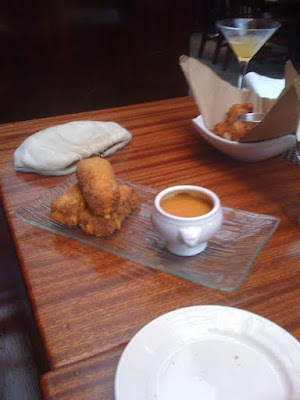 I think one of the most inventive dishes is the fried grilled cheese sandwich, served cut up vertically with a little tureen of cheddar and tomato soup for dipping. To die for. 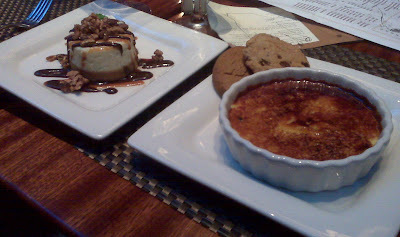 Don't think about leaving without dessert, you would regret it. An ariel shot of our table that I took from the 2nd floor balcony just outside the old telephone booths that now have been updated with gold plated "Cell Phone Booth" signs. Oh, these times they are a changin'. 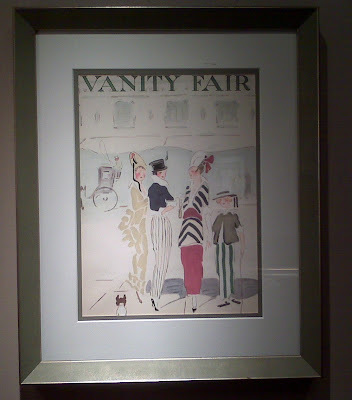 The vintage artwork around the restaurant adds to the old world charm, including vintage fashion covers framed above the vanity in the ladies room. 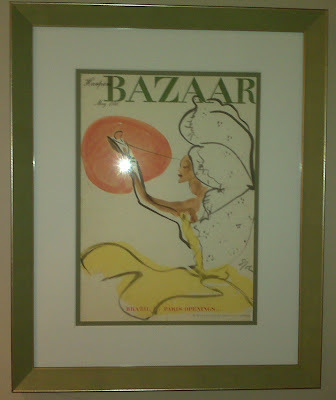 Want to recreate at home?...Vintage Vogue artwork can be purchased directly from the Conde Nast online shop, or a quick search turned up quite a few hits on ebay as well. If I can track down the Cell Phone Booth signs, I'll let you know. Columbia Firehouse also has a truly inspired cocktail menu. My personal favorite was the, ROCHAMBEAU YOU FOR IT (Any cocktail with St. Germain is my go-to this summer), but the Lime Rickey is also quite tasty. If you're in the area, make sure to check it out. I know that I'll be back often. 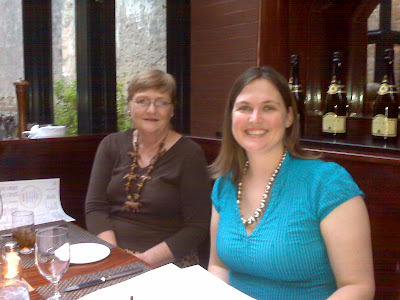 Probably dining with these two lovely ladies. True devotee followers of the chef...his mother and wife. Hey, it pays to have connections! Top photo from LocalKicks taken by John Arundel. I absolutely love it when local places that I frequent get good press. And this may be one of the best in a long time. 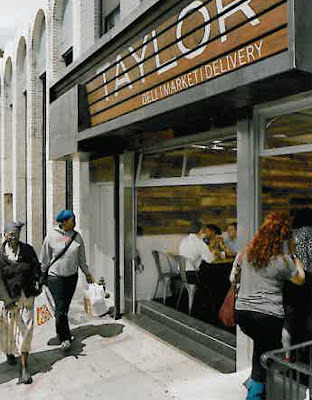 Taylor Deli is a fairly new Italian deli and gourmet market open in my own little 'hood of Capitol Hill. I was playing mommy-for-a-night a few months back, babysitting this little cutie, and low and behold my services were compensated with the most yummy sandwiches I've ever had (Thanks, Sara!). I had to go check it out for myself. 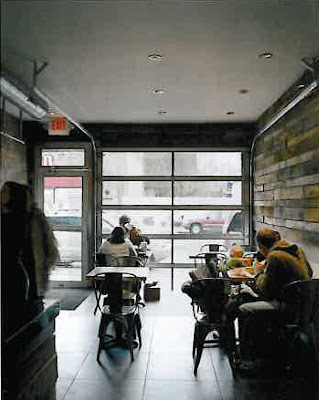 I got there only to discover that the deli and market is so industrially-chic and beautiful on the inside; I was giddy. So when I opened up my September issue of Dwell and saw a huge spread not only on the deli, but also a peak inside the homes of the impressive best-friend since middle school owners, I was practically on the floor. 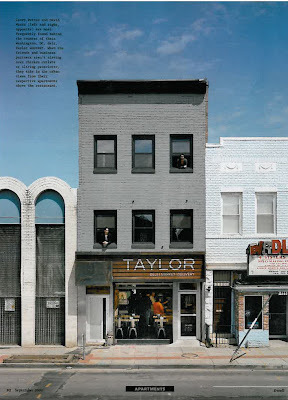 Located on the growing H-Street corridor in DC, this is one of the up and coming businesses trying to return the neighborhood to it's glory. 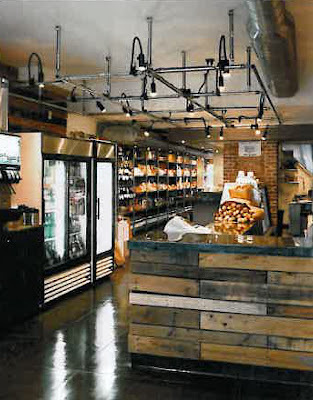 The deli is located on the bottom floor and co-owners Casey Patten and David Mazza renovated the 2nd and 3rd floors into coordinating bachelor pads. 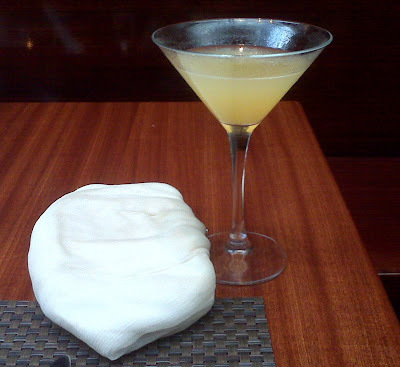 (Did I mention that I'm single and enjoy things like good design, construction projects and gourmet cheese?). See that right below, yup look down. That's an all glass garage door that serves as the store front. It rolls right up during nice weather to give it that open, market feel. 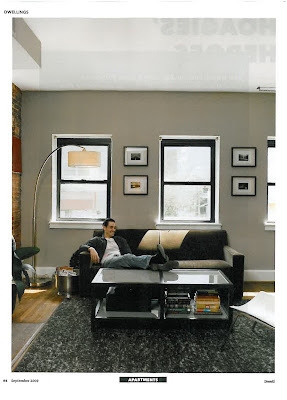 The tops floors of the building were renovated into open, airy bachelor pads that are a beautiful pallet of neutrals and pay respect to the structure of the building. 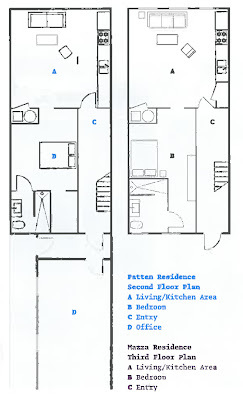 With each pad spanning just 850 sq ft, the guys used simple floor plans, quality pieces and modular kitchen material to make the space seem luxurious. This is Casey's pad on the 2nd floor. 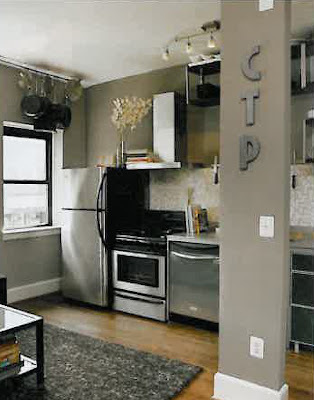 I think those might be off-storage pans hanging from a track above the window. While the guys claim to have no architectural background, they certainly have a little experience from some previous time in construction and real estate as well as a shared appreciation of good design and quality living (see again, single girl comment above). 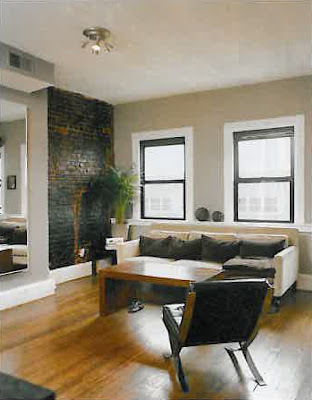 David's apartment on the top floor of the building is similar in layout and feel, both highlighting beautiful exposed brick walls that were uncovered during the demolition they did themselves. 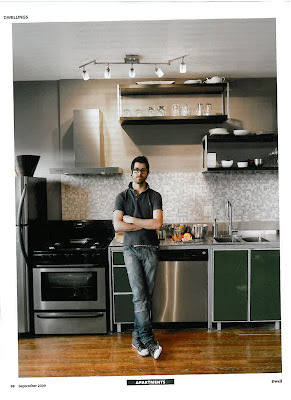 David's cabinets (which I think are similar or identical to Casey's but I couldn't tell from the article) use Ikea cabinet bases mixed with found steel counters measured to fit and a custom drop in sink. I love it when people aren't afraid to rock their Ikea finds proudly by putting their own spin on them. Back to the deli--if you're anywhere near the DC area, you really should make a trip. Catering, take out, or delivery, get it anyway you can. An absolute MUST are the risotto balls. Cheese and risotto rolled together and lightly fried, they are heaven. I think about them often. The market also carries Ciao Bella gelato, stock up when you're there. I can't pick a favorite sandwich (although turkey, sundried tomatoes and provolone is near the top), I usually go with friends and we each order differently and then slice them up to share. 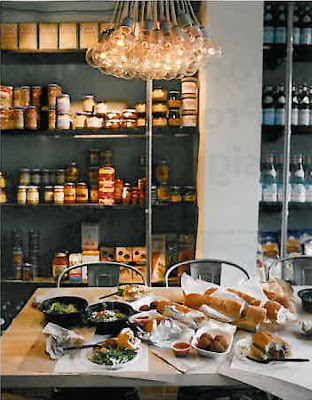 See that amazing light fixture the deli sports...the cluster of exposed bulbs that looks like it could be bought for a ridiculous price at some fancy store. Owner, Casey Patton, made it using basic materials available anywhere. 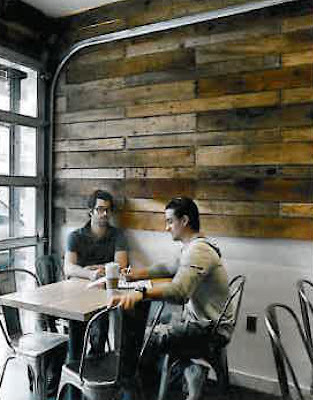 Sustainable design was important to this pair, which is why the walls of the deli host rehab'd wood salvaged from cast away palettes the guys found around town. 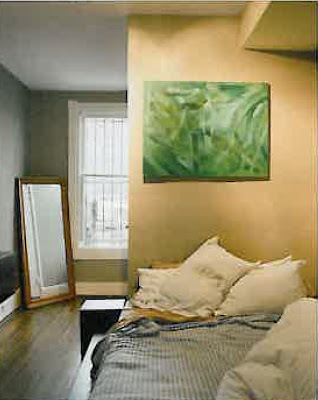 A big thanks to Dwell for a great article on this local treasure. I think I know where I'm heading for dinner tonight. I've come across a bit of a dilemma. One of those times when you find yourself questioning why you hold a certain style rule in the first place. I don't typically have a lot of rules to begin with. I wear white with abandon all year long. I don't always center my pictures on walls, and usually just about the time someone says "because that's just how it's done," I do it my way anyway. 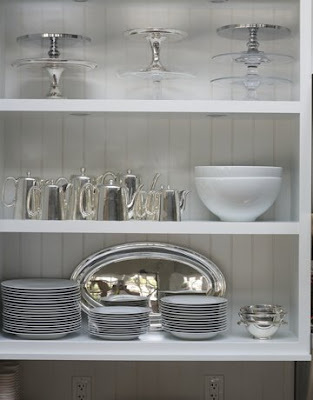 But I've always held tried and true, that white dishes are the absolute best. They showcase food better, they go with every kind of table you could want to create, they have simple clean lines, on and on go my reasons. Until I catch glimpse of a pattern that is so irresistible to me, I want to throw my whole philosophy out the window and just buy the ones that are pretty! Here are the current culprits that are throwing a wrench in my nice simple life plan. 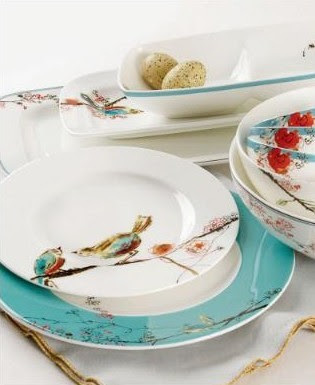 Lennox Chirp Dinnerware, something about these little birds cracks me up, and I love how the pattern spans across the dishes. Wouldn't you like to wake up to these little guys at the bottom of your cereal bowl? Kate Spade Morella Avenue. Oh, Kate, how you drive me wild with your gold rimmed, animal print ways. Lauren Ralph Lauren Mandarin Blue. 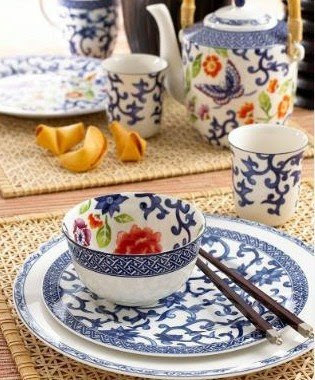 I love how the family of patterns carries over in different ways on each piece of this set. Maybe I would be inspired to expand my cooking repertoire and ditch my twice weekly carryout habit. 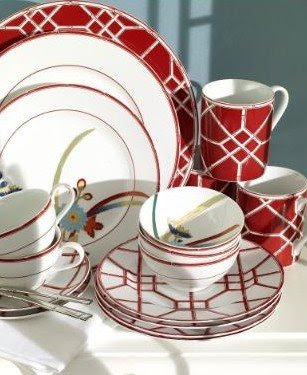 Lauren Ralph Lauren Red Pagoda, A little geometric, a little floral, with a splash of red thrown in for good measure. 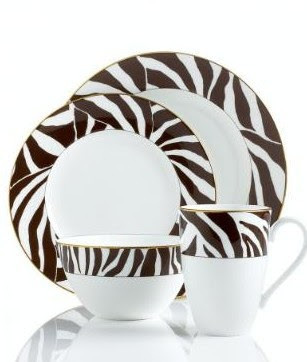 I would buy this set for those dessert plates alone. Thanks to everyone for sticking it out during my little summer blogging break. I not so much decided to take a summer hiatus, as it just seemed to be one of those times when everything else around me was taking all that I had, that I didn't have anything left for myself. Sometimes I feel like I have two realities. I have the reality that is everyday life, with happiness, sadness, ups and downs little and big (and at some points, down right Mumbo Jumbo!). And then I have this wonderful little reality that I've created in blogland, complete with a whole host of friends who are funny, creative and inspiring. But sometimes, my realities don't feel like they mix into one seamless existence and this was one of those times. I am truly grateful for the positive energy, inspiration and people that blogging has introduced me to. It challenges me, excites me and fulfills me in ways I never expected. But there are some times when my created blog reality doesn't seem to go hand in hand with my actual reality. Two weeks ago I lost a very important man in my life. After a lengthy battle with cancer, my Grandfather passed away and left a hole in our family that we will never fill. The reality of moving on from that just didn't seem appropriate for a blog about wallpaper and watches. But when I came back and was catching up on everything that had been happening here, the posts I found myself reading closely, were the ones that were honest about blending daily reality in with our daily inspirations. My grandfather was larger than any reality I know, able to move mountains as if they were made of feathers. He challenged me to pursue a career I was passionate about and to take pride in everything that I do. There are no two greater lessons that you can leave your children and grandchildren with and he taught them by example. A proper handshake is truly an art form. Eye contact, a firm grip, a fluid shake and a warm smile. I learned from the best. My grandfather had a formidable handshake-firm, solid and strong. From the time I was little, when others patted my head as a sign of hello, my grandfather stuck out his hand as if I was his equal. As a child, I would look at him with a perplexing stare and timidly stick out my arm to mimic his behavior. Each time I put my small, limp hand in his, he would say, "That's not a real handshake. Shake my hand like you mean it. You gotta let people know that you're here!" The social lessons of this were above the grasp of my young mind, but I did as he said, griped his palm firmly and gave it a good shake. What he knew that I was still learning was the lesson of every self-made individual. That in life, no one is going to believe in your abilities if you don't believe in them yourself. And, how are people going to know you are there, if you don't stand up and tell them. I grew older, went away to college, and then to graduate school and finally moved away to the city to take a job. I often meet people for the first time, extend my hand in greeting and hear back "That's a mighty handshake (usually followed by some kind of comment about women, which I attempt to ignore). You don't find many people with a good, solid handshake anymore." And I smile and think that my grandfather would be proud. Each of us have our own memories of this man who meant so many things to so many individuals. As we pause from our daily activities to celebrate the life of this husband, father, grandfather and friend, please extend your hand to those around you, give them a good firm handshake and let my grandfather know that you are here. The intertia to get myself going again after a little time away was harder than I expected, yet strangely I found myself constantly scribbling things down or snapping pictures of things that I wanted to share with everyone. I'm happy to be back and maybe inching my way to that never achieved goal of balance. Back to the wallpaper and watches tomorrow, I promise! 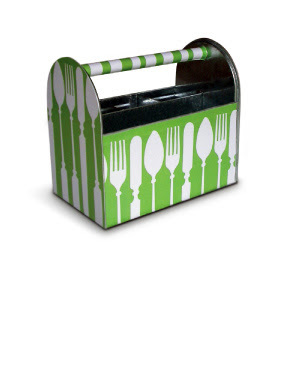 I love this caddy from the MacBeth Collection for carting all those tabletop necessities outside to enjoy a meal al fresco. Now if only they made one big enough to tote wine, I'd be all set! P.S. The company slogan is great too. "Beauty is in the eye of the beholder...we can help with the holder." One of the things I have yet to really master, but always long for is a functional and beautiful desk space in my home. 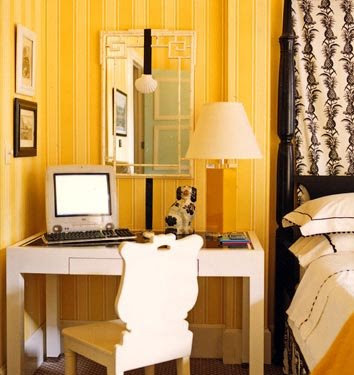 I need an administrative hub for all the bits of creativity that float through my daily life--A central wrangling zone for the inspirational (picture, magazines, color swatches) and the not so inspirational (pesky tax returns, why must you be so unappealing!). And since I don't have space for an entire room dedicated to an office, it all has be nice to look at everyday. Enter, The Inspired Office. 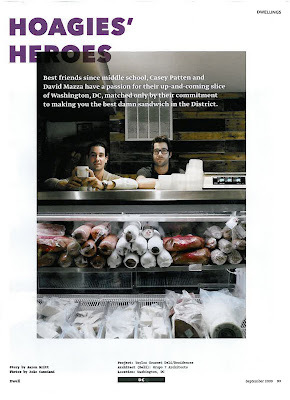 About a year ago I was introduced to Kacy Paide's company, The Inspired Office, through an article in the Washington Post. I signed up for her newsletter, and was immediately hooked on her organizing tips and secrets. Kacy is a professional organizer who helps clients throughout the DC area turn their piles of paper and stacks of lists (both of which I have plenty) into something more inspiring to work from. Even in you're not in the DC area, I highly recommend going here to sign up for the weekly newsletter. Hurry, go now and you'll still catch this week's edition tomorrow. Abby's Organizing Method: Carry a really big handbag and throw all of the scraps of paper and bits of inspiration you find into the bottom of it. Then wait until it's too heavy to carry anymore, dump it all out on the bed to sort, get frustrated, put it back in the bag and switch to a different handbag. Abby's Organizing Method: Keep a basket on the desk or counter and designate that as the "filing basket." Continually place everything from bank statements to menus with great logo designs in said basket. Never file things away from the basket because they all seem to random to put in folders. Let basket get so full that it's overflowing onto the counter. Buy new basket to set next to it. 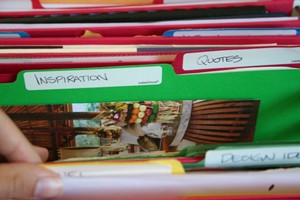 The Inspired Office Method: Make File folders with general categories for the things that are important to you (see photo above from Kacy's website.). And then use them. If file folders with labels are too much of a commitment, use sticky notes stuck vertically on the files until you're done with your initial sorting. 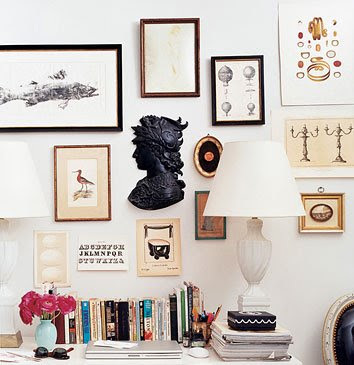 Here's to your inspired office! Hi All! 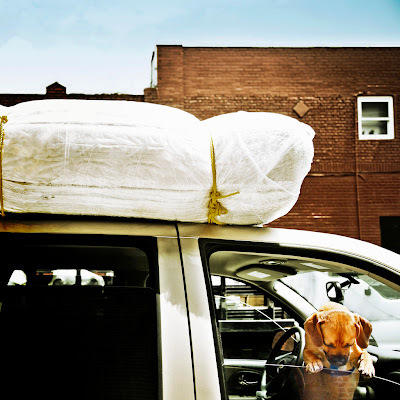 Thanks for sticking it out with me while I took a little blog break for some family time and also...a big move! It was a whirwind of a week, including the return of R&B, who are now safely back home and exploring their new yard. I'm looking forward to catching up with everyone and getting back into regular blogging. Stay tuned this week for some great posts. Even before all my boxes were loaded into the new house, I was thinking about what I needed to really make the new place feel like home. Yes, the list was long, but the item that stuck at the top was some new stationery. Nothing makes a home yours like embossing the address on great cardstock! iomoi makes some of the most modern, fabulous stationery around. Perfect for a fresh start with a new monogram. Except, there are so many that I love, I literally cannot narrow it down to just one.